Third Person: He spotted Susan walking down the street. Second Person: You spotted Susan walking down the street. Finally, omniscient POV uses an all-seeing, all-knowing narrator to relate the story. Although omniscient POV was common in classic literature, you won’t see it that often in contemporary fiction. This is probably the easiest POV in which to share what your main character is thinking, because the narrative is basically your main character’s running commentary on events. 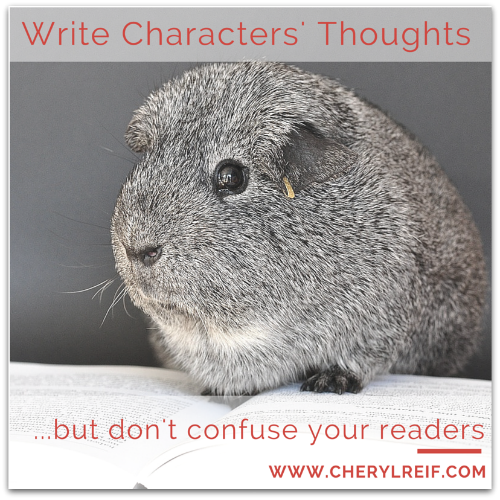 You can make this point of view work for you by taking care to insert your character’s opinions, blind spots, judgments, biases, fears, loves, etc. into the writing. There are several ways you can reveal your main character’s thoughts when writing in first person. Here the author shows the main character’s reaction both with her physical response (cringing) and with the question she asks silently rather than out loud. Notice that Denise doesn’t use any dialog tags for the character’s thought. The reader knows who is speaking (Kat, the book’s narrator) because Kat has been the only one speaking. This approach uses a tag–“wondering.” You’ll notice that most of the examples in this post don’t use a tag. That’s because a tag creates a little bit more distance between the reader and the narrator. Want to show your character’s thoughts? Ditch dialog tags; let VOICE do the talking! Play out an internal argument or show a character’s inner struggle. This example is like the first, in that there’s no “tag” for the character’s thought in the first sentence. However, Denise adds italics, probably because the word “you” could possibly trip up a reader. With the italics, it’s clear that Kat is mentally articulating this sentence—almost speaking it aloud, but not quite. Which is more immediate? The first, right? Denise uses the italics to show a subtle difference between these two passages. The first is written the way a line of dialog would be–except without quotes, in italics, to show that we’re getting Kat’s thought transmitted directly from her head, with no editing or explaining. In the second, the “camera” pulls back a little. We’re back in the book’s normal voice–still hearing Kat’s thoughts, but without the same immediacy. Reveal voice with a sarcastic—but unspoken—comeback. Like the last example, this one seems to show the narrator’s direct thoughts, but without italics. Why not? IMO, because the italics/no italics question is a matter of style and preference. In the previous example, italics help to prevent confusion when the narrator says “you.” Here, it’s clear that we’re getting the narrator’s thoughts, so the italics aren’t needed. I love italics and my first (unpublished) novel is filled with italicized thoughts. Since then, I’ve learned that most editors tend to frown on their use–so use italics sparingly, if at all! Show a character figuring something out. Hope you’re having a great summer with plenty of time for life, fun, and (of course!) writing!